Dare to become a pirate at this port town overflowing with the notorious pirates of the Caribbean and be sure to say “Ahoy Matey” if you run into the one-and-only Captain Jack Sparrow! Catch a glimpse of Captain Jack Sparrow—a captain who can always be trusted to not be trusted. You’ll come across him and his rowdy crew of scoundrels at this action-filled pirate haven overflowing with fun adventures and blood-curdling danger. Captain Jack Sparrow is the cleverest pirate in the Caribbean, but also an honest man. He sails his ship, The Black Pearl, seeking treasure. Jack loves the freedom his ship gives him and is always looking for what lies beyond the horizon. Follow the successful path Pirates of the Caribbean has taken since it was introduced to the public in 1967. Walt Disney and his Imagineers—a team specializing in imaginative engineering—decided to turn an idea they had for a pirate wax museum into an attraction using their latest innovation called Audio-Animatronics technology. So, on April 19, 1967, Pirates of the Caribbean opened in New Orleans Square at Disneyland Park in California. It was the last attraction that Walt oversaw being created, and unfortunately he didn’t live long enough to see its completion. But he would have been proud and amazed by its extraordinary success. Pirates of the Caribbean—featuring multiple Audio-Animatronic pirates, animals and birds—was immediately popular. So, a slightly modified take was created for Walt Disney World Resort in Florida, which opened on December 15, 1973. Again, public demand grew. Versions of it soon opened at Tokyo Disneyland in 1983 and Disneyland Paris in 1992. Next, in 2003, a blockbuster film franchise was born with the release of the first Pirates of the Caribbean film—starring Johnny Depp in the role of Captain Jack Sparrow! Three other films soon followed, with a fifth film set for release in 2017. 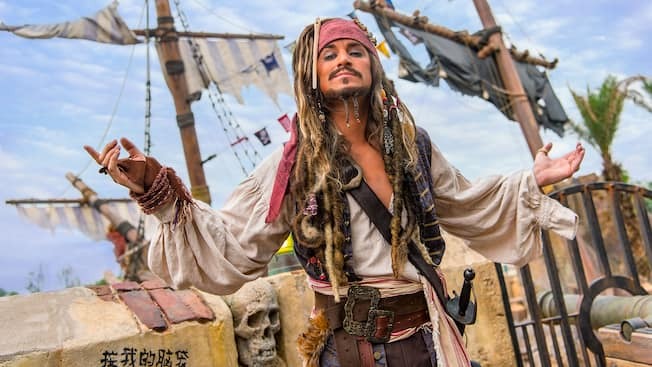 And now at last, Guests can experience an entire land devoted to pirates at Shanghai Disneyland—the first pirate-themed land in a Disney Resort anywhere in the world!